Pincushions have gone from the functional to the collectible very quickly! Wool pincushions are particularly hot right now, although I feel like they should be enclosed in a glass case to keep them from getting dusty. Do you collect pincushions? Do you like a particular pattern designer? Oh My!! That is adorable! I love pincushions and have been collecting vintage pincushions for years. I made a few new ones as well. 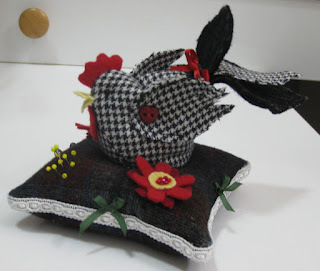 Love the hen you have in wool! That is a seriously cute pincushion! Recently I started a pincushion board on Pinterest. I like the handmade ones the best!